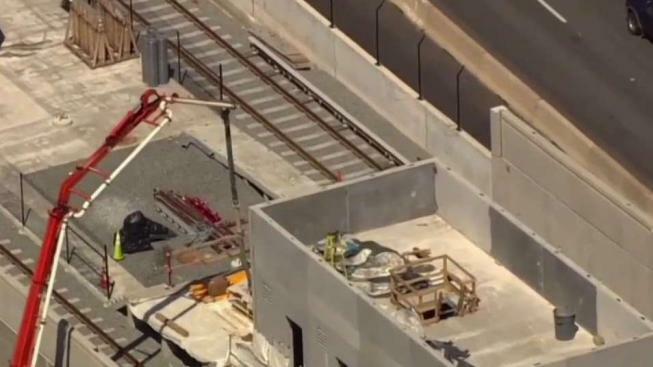 After learning of faulty concrete in the second phase of the $2.7 billion Silver Line extension, Metro is talking about its own engineers taking a look at the problem areas, possible legal action and possibly setting up a fund so Metro doesn’t have to pay. The concern has to do with concrete panels serving as walls for the new Metro stations. In some cases, the water-to-cement ratio is off, the steel inside the panels is not covered by enough concrete and there are insufficient safeguards for water to expand and contract. In all of these cases, water could penetrate the panels, leading to cracking and rusting. Project leaders identified 1,750 panels as areas of concern. Those panels have been installed at every station along the new phase of the project except the Dulles International Airport station. “I would say yes, as a citizen and certainly as the Metro Board chair, I am concerned about the project,” D.C. Councilman Jack Evans said. At Metro headquarters Thursday, Evans talked about possible legal action. Metro General Manager Paul Wiedefeld said his team is inspecting the concrete and an escrow fund may have to be set up to make sure Metro doesn’t pay for the mistakes. “Obviously, we are going to make sure that we are protecting the interest of Metro going forward,” he said. Project leaders say all the costs fall on the contractor who produced the faulty concrete, Universal Concrete Products of Stowe, Pennsylvania, and there won’t be a substantial delay because of this. Inspectors found equipment at Universal Concrete was not properly calibrated and a change from a manual method of checking water-to-cement ratio to an automatic machine-based method caused the issue. Universal Concrete has not returned calls and emails asking for comment. In northern Virginia, leaders say the Silver Line is too big to fail. The project is being built by the Metropolitan Washington Airports Authority and will eventually be turned over to Metro. The 11.4-mile extension of the Metro system will bring Metrorail to Reston Town Center, Dulles International Airport and Loudoun County for the first time.